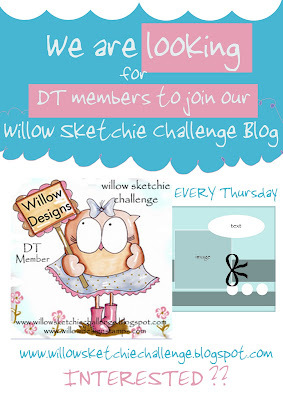 We are looking for a bunch of enthusiastic card makers who would love to use a selection of our products in our weekly Willow Sketchie Challenge Blog. You must have a regularly updated blog and be able to make 1 card a week. We welcome all level of crafters and applications from previous DT calls. Intersted? Please email willowdesigns@sky.com with 3 card examples, a short paragraph about yourself along with a link to your blog.